Gemtek WL-530AG is a 32-bit wireless cardbus capable of transfer rates of up to 54Mbps. Its dual band feature allows you to roam seamlessly in 802.11a, 802.11b, and 802.11g network. 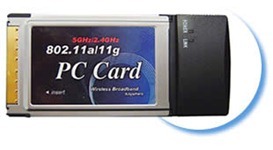 With this PC card, you can connect to a wireless network over standard 32-bit cardbus architecture for optimal performance capability. WL-530AG is Wi-Fi compatible. It gives you the interoperability with 802.11a, 802.11b, and 802.11g wireless routers, access point and adapters. It can connect to either 2.4Ghz (802.11b or 802.11g) or 5Ghz (802.11a) networks without changing adapters. It has easy-to-use interface and friendly setup wizard with driver support for Windows 98SE/ME/2000/XP. You can easily connect wirelessly at home, at office, and at public hot spots. WL-530AG also features up to 128-bit WEP encryption, ensuring the security of your data transfer. You can choose a 64-bit key or a 128-bit key to meet the need of your application.